Karen Anderson worked as an economist forecasting the U.S. macro economy for 15 years from her home in Vail before deciding on a new career path teaching yoga and meditation. What: Community Meditation, led by Karen Anderson. When: 5:45 to 6:30 p.m. Sundays. Where: The Vail Vitality Center, 352 E. Meadow Drive, No. 3, Vail. Cost: Free for members or $10 per person for nonmembers during meditation time only. VAIL — When Karen Anderson heard that a group of her friends were attending a month-long silent meditation retreat in India, she was intrigued — and terrified. She’d never meditated before, but that didn’t stop her from hopping on a 17-hour flight. It was two weeks into the retreat that Anderson had an epiphany: “My job was no longer the thing for me to be doing,” she said. It was 2007, and Anderson, who had worked as an economist forecasting the U.S. macro economy for 15 years from her home in Vail, decided on a new path. It wasn’t a small decision for Anderson, who’d invested considerable time and energy into her career, including an undergraduate degree in economics from Stanford and most of a Ph.D. in economics at Berkeley. After college, she spent two years on Wall Street, working at Goldman Sachs as the first female in their economics department. Despite all that, she wasn’t anxious about the change, she said. Anderson, who’d taught yoga for eight years prior to the retreat, came home and transitioned into doing massage and teaching Pilates and yoga. For the past four years, she’s taught yoga and meditation exclusively. 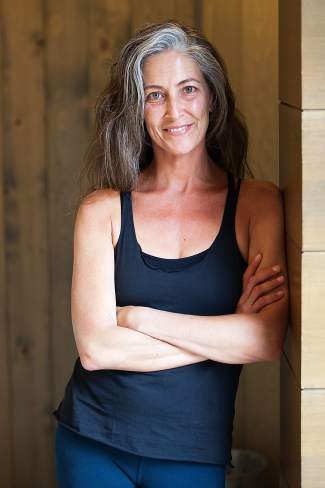 This month, Anderson officially takes over as the new yoga director at the Vail Vitality Center. It’s a full-circle experience for Anderson, who started practicing yoga at the Vail Athletic Club 20 years ago. She’s taught there for close to a decade. The studio “has evolved as a community,” she said, which provides an opportunity to go deeper with the type of programming and workshops offered. Anderson plans to expand the meditation offerings at the Vail Vitality Center, she said, something that feels very serendipitous in its timing, considering how much interest there’s been in meditation of late. “It’s wild — people want it now. It’s being really well received,” she said. So what accounts for the change? Overstimulated from our constant connection — and some would argue obsession — with technology, people need a break, Anderson said. “We’re in this remarkable time in a place where people are poised to take control of their own health, and yoga and meditation are a big part of mental, spiritual and physical health,” she said. Anderson taught one meditation class per week at the Vail Vitality Center for a number of years and now teaches two. Beginning this month, the Sunday night meditation class, which is 45 minutes long, is now offered as a $10 community class. Meditation retreats and workshops will be offered, but it’s the weekly classes that are the heart of the program, she said. “We get to know each other and we get to talk,” she said. “It becomes a community,” Anderson said. While technology has been great for some aspects of our lives, it can also stand in the way of face-to-face, meaningful connections, Anderson said. As you’d guess, she is the analytical type who likes to get at the root of what’s happening. That’s what made her a good economist and now what makes her talented at her second career. Last month, Anderson spent 30 days at a silent meditation retreat, this time in Bali. It’s such a powerful experience that she does it every spring, without fail. She just finished her 10th retreat, she said. Caramie Schnell is the owner of SkyWrite Communications & Content. Send questions or comments about this article to kdriscoll@vaildaily.com.